The Tungsten E2 has integrated Bluetooth, providing Web browsing and email via a similarly equipped mobile phone. 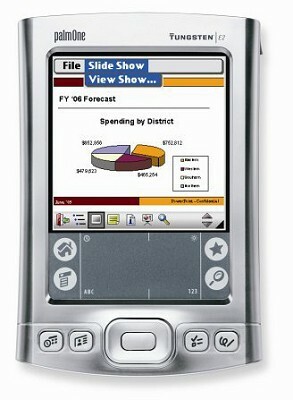 Wi-Fi connectivity is possible, by adding a palmOne Wi-Fi card. The E2 also has a stereo headphone jack and a multi-connector, compatible with all of palmOne's latest power and synchronisation cables, such as the cradle kit, travel chargers and car charger. The new, brighter color display makes it easy to see all you applications...schedule, contacts, and work documents, even outdoors. And with improved color saturation, your photos and video clips come to life in vivid, dazzling color. The built-in Bluetooth wireless technology allows you to synchronize with your computer without the restriction of wires. Use your handheld with a Bluetooth phone and the VersaMail email client to send email and text messages, or surf the Web with the Blazer web browser. There's loads of space to hold your contacts, calendar, photos, applications, and even your spreadsheets or presentations. The flash memory helps protect the information on your handheld, even when you forget to recharge. With Documents To Go, you can create and edit Word and Excel documents, and view your PowerPoint files, on the go. And with an easy conversion step, you can even view Acrobat PDF files. New long-life battery has more longevity than the original Tungsten E handheld battery, allowing you to get the most out of your PDA before you have to recharge. Sync your contacts, tasks, calendar, notes and email from Outlook to your handheld. Get organized with day, week, and annual calendar views, and color-coded appointments. Use the VersaMail email client to read email and draft replies out of the office. Then send your responses when you synchronize back at your computer, or wirelessly with a compatible Bluetooth phone. Insert your memory card into the expansion card slot and use the built-in speaker, or a set of stereo headphones, and the Tungsten E2 handheld becomes a portable MP3 player. You can display digital photos and watch movie clips on the Tungsten E2s incredibly sharp screen.